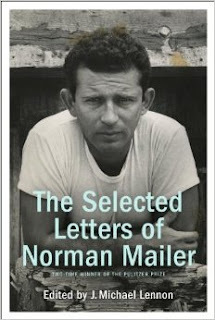 Andy Howe's "In Cloud Light III"
And more podcasts with J. Michael Lennon about Norman Mailer. One very articulate and original economist. About an hour long, very now. James Howard Kunstler's conversation with artist "Lord Whimsy"
P.S. Couldn't resist: Jenna Marbles' Hello Young People, I'm Hillary Clinton. P.S.S. I'm just back from Pecos, Texas; two new and very fun podcasts for the Marfa Mondays Podcasting Project to be posted soon. A new website on my radar: Western Digs, by veteran science journalist Blake de Pastino. My own interest is in the Trans-Pecos region of Far West Texas (more about the book-in-progress here). In case you missed it, my podcast interview (with transcript) with Greg Williams, Executive Director of the Rock Art Foundation, is here. Plus here is a batch of brief videos of some of the rock art sites in the Lower Pecos and elsewhere along the US-Mexico border, as well as other sites in the Trans-Pecos. No, as an author I'm not all jumping-jacks about self-publishing— publishers can and, on many an occasion, actually do provide important added-value to a book. (My own have been published by Grijalbo-Random House Mondadori, Literal Publishing, Milkweed Editions, Planeta, Unbridled Books, University of Georgia Press, University of Utah Press, and Whereabouts Press— whew, that list is as much a testimony to the diverse genres of my books as to the tumult in the publishing industry.) But as I noted in this previous blog post, the light flashed on for me when I realized, no matter what happens with my future books, because I have self-published several ebook editions and the print-on-demand paperback, Metaphysical Odyssey into the Mexican Revolution, and because digital bookshelf space is marginal cost zero 24/7 (in other words, click, it's in the store, and nothing digital is going out of print anytime soon), for the rest of my natural life, I will always play some role, whether large or minuscule, as my own publisher. And towards that end, I realized, it would behoove me to figure out, or rather, continue trying to figure out what the heck I'm doing. Over the past few years, for my imprint, Dancing Chiva, I've explored my way around a good part of this newfangled digital labyrinth (PODs, Kindles, iBooks). But of course, there is always more to learn; publishing is a fast-changing game. Ergo, I signed up for the Independent Book Publishers Association's 2 day 2015 seminar "Publishing University". It was, in two words, Austinesquely fabulastic. +Most people, when thinking about how to sell a book, conflate discovery with conversion. +The vast majority of book buyers are not even aware of best-selling authors! +Internet promotions (via email, social media, free Kindles, etc) has "generated a lot of low quality discoverability." +Analog publicity remains very effective. The quality of discoverability is key. +The book needs to get rated. But books must be read before they can be rated. Therefore offering free ebooks as a way to improve discoverability is low quality. + The discoverability source affects 5 star ratings. +Many times there is a disconnect here. There is no conversion to sales without discovery. "Conversion" is not about liking, it is about acting— actually deciding to buy the book. likely to buy their favorite authors and to give more favorable reviews. "Brand author" = 500,000 fans or more. +An author brand is a "rare and valuable asset" but this is not the same as "being famous." Lots of famous and even belovedly famous people publish books that tank. +Readers do not always connect the author with the title of the book. In other words, they may love the book but not remember who wrote it. 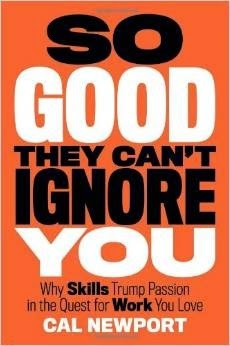 Key: if the author wrote a book with a recognizable title, it makes a difference to add "Author of XYZ," to the cover. Hildick-Smith then gave a slide show of a study on buyers' reactions to alternative book covers. Oftentimes it was the ineptly designed books that performed better (!!) 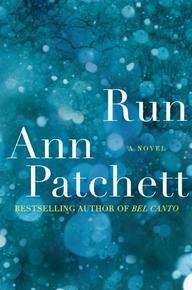 And it rarely worked to have the author's face on the cover, even when that author is both famous and attractive. The speaker ran out of time, alas, before he could delve into this topic, but I don't think many in audience minded because his slide show about book covers was so entertaining and full of practical advice. +brick-and-mortar bookstores remain the the largest discovery source, not amazon.com; +to sell books, you must have discoverability and convertibility and availability. Tim Hewitt, sales rep for Friesens, gave an excellent and fascinating talk about the elements of a traditionally printed book. I didn't take elaborate notes on this one, but I was delighted that he could answer my question, Why is the POD (print-on-demand) paperback so much heavier than an offset-printed similar sized book? I have two editions of my book in Spanish, one printed in the U.S. as a POD under my own imprint, Dancing Chiva, the other offset printed (traditionally printed) in Mexico by Literal Publishing. The editions are the same design and size (only a couple of centimeters of difference), but the Literal Publishing edition is both nicer and substantially lighter weight. Hewitt's answer was that the machinery for PODs requires heavier paper, but with offset printing, you can go with lighter weight but still thick paper, which saves money on paper and shipping, and also maintains spine width. Hewitt emphasized that, before deciding on your paper, it is key to understand, who is your target audience / the end user of your book? Hewitt also fielded several questions from members of the audience who were concerned about environmental impact of the printing industry. The Friesen's website has a page dedicated to that very subject, with some surprising information. Laura Dawson of Bowker, the ISBN agency, gave this super chewy talk about ISBNs, Library of Congress numbers, BISAC categories, and best practices. 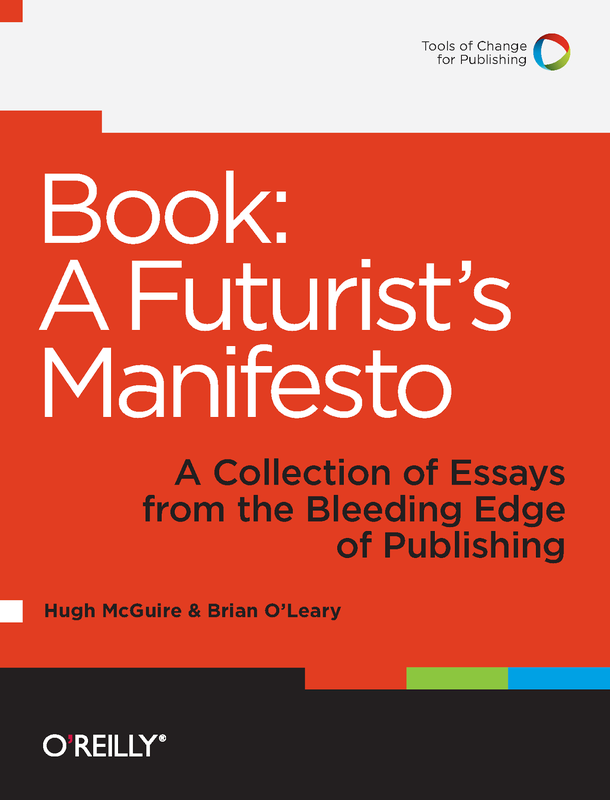 I googled around and found Dawson's chapter, "What We Talk About When We Talk About Metadata," from High McGuire and Brian O'Leary's Book: A Futurist's Manifesto (O'Reilly), which is better than my notes. Tanya Hall, CEO of Greenleaf Book Group, gave this riveting talk— it was at the tail-end of this cram-packed conference, so that's saying a lot. + Why video? Discoverability. Video is 52 times more likely to show up on Google search than text results. +Video gives a personal connection, humans are drawn to other humans, used right it can increase the trust factor, use it to set tone at events. + Put your video on your website, a video landing page can increase conversion by up to 80 percent. My current enthusiasm is for making 1- 2 minute edited videos that can work like a step-up from a GIF to illustrate an article / book / blog post— although I realize that these don't necessarily help sell books or "go viral," as would, say, a baby moose frolicking in a lawn sprinkler. I do have a couple of longer videos about my latest book on my "to do" list— a trailer and a talk about some of the rare esoteric books I consulted, which I'll get to... oh, lala, one of these days-- and maybe sooner rather than later. More importantly, I doubt my readers, current or potential, are those who spend their free hours surfing around on YouTube. Greenleaf Book Group is one of several new so-called "hybrid" publishers at the seminar, and I am happy to see them because it seemed to me that there was a yawning gap that needed to be filled. On the one hand, there are traditional publishers and on the other, various vanity presses, from CreateSpace to Lulu and all the rest of those that publish anyone and everyone and their uncle's chinchilla's macaroni recipes. What is needed, and so I see from this "Publishing University" seminar is beginning to emerge, is a viable business model that offers not only professional quality editing, design, and marketing, but some curation. So yes, the author does shell out the clams, but his book won't end up swept up with the roaring river of riffraff. 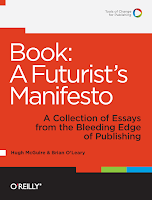 Related to this is the emergence of more accessible a la carte services, including book design, cover design, cataloging and metadata consulting, editing, copyediting, ebook file testing and quality assurance, indexing, and of course, ye olde book marketing. For example, Firebrand Technologies, TLC Graphics, and Philadelphia-based Parlew Associates are now on my radar. > Read my Q & A with Michele Orwin here. 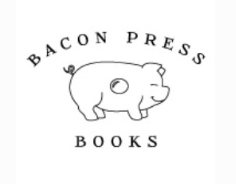 > Read Bacon Press Books Q & A with Yours Truly here. There were more panels I attended, all excellent, and, lacking a robotic avatar, many more I couldn't attend. Another benefit was the chance to talk with the various vendors, among them, graphic designers, freelance publicists, editors, and many printers, as well as old friends and workshop students. In addition to Michele Orwin, there were several people from She Writes, including Barbara Stark-Nemon, who took my fiction workshop at the San Miguel Writers Conference, and whose historical novel Even in Darkness is just out; and Denise Camacho, President of Intrigue Publishing. Literary, scholarly, cookbooks, Christian, mystery, history, diet advice, bear attack memoir, marketing how-to— participants were publishing an astounding variety of books. In sum, if you're at all interested in learning about the nuts and bolts of publishing, whether as a small publisher or as a self-publisher, the IBPA's Publishing University is an all-star 2 day conference. Next year, 2016, it will be held in Salt Lake City, Utah. > Your comments are always welcome. One of these days I'll get my next newsletter out. You are welcome to sign up for that here. Delighted and honored that Guadalajara-based journalist Stephen Woodman's Mexican Labyrinth has a piece on my latest book, Metaphysical Odyssey into the Mexican Revolution. It is an inconvenient fact for Mexican historians that the “Father of the Revolution” Francisco I. Madero, kept in regular contact with spirits of the dead. Yet Madero, who served as president from 1911 until his assassination less than two years later, was a deeply committed spiritist and believed he spoke to departed relatives and possibly even former Mexican leaders. Through his practice of mechanical writing, Madero put pen to paper and let invisible beings guide his hand, shakily transcribing words of wisdom from beyond the grave. With a “Metaphysical Odyssey into the Mexican Revolution,” U.S. novelist and translator C.M. Mayo has written one of the only books to focus on this key aspect of his life. Featuring the first English translation of his secret work, the “Spiritist Manual,” the book presents Madero’s overview of his own guiding beliefs. > More about the book here. 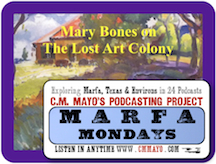 Two New "Marfa Mondays" Podcast Transcripts: "Charles Angell in the Big Bend" and "Mary Bones on the Lost Art Colony"
You can listen in to all my podcasts anytime, but I know some of you read at a faster clip than you can listen, so I've been posting the transcripts bit by bit. As of last night, new on the website are two more transcripts of Marfa Mondays podcast interviews, both of which provide excellent introduction to the topic at hand, adventure in the Big Bend and the "lost colony"-- of artists who came to this spectacularly scenic region well before Donald Judd. If you've been following this blog and/or the Marfa Mondays podcasts you know I'm a nut for rock art sites. Indian Head, which I visited back in February of 2013, is one of my favorites. It's only a short drive behind Terlingua's main gas station, but it feels as far away as Mars (and it's that quiet, too). Here's my mini-clip video, starring my expert guide, Charles Angell (who, by the way, I highly recommend for any adventures on and along the Rio Grande and around the Big Bend). The soundtrack is courtesy of the phabulous Phizmiz, Ergo, that is. 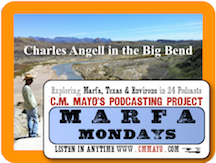 > Marfa Mondays #2, "Charlie Angell in the Big Bend"
> Marfa Mondays #15, "Gifts of the Ancient Ones: Greg Williams, Executive Director of the Rock Art Foundation, on the Rock Art of the Lower Pecos Canyonlands"